This week is big for me, guys. My baby girl turns ONE! How the heck did that happen?! It seems like just yesterday we were figuring each other out in the hospital room, me sitting on the edge of my bed in the middle of the night struggling to stay awake, her latched on and looking up at me with her sweet doe eyes. I had some long nights and rough days ahead of me as a single mama, but every rough moment melts away when she leans in for a slobbery kiss or flashes her cheesy smile with scrunched up nose at me. Thursday is her first birthday, and we'll be celebrating with family and friends, but I wanted to share a timely post today all about the importance of documenting moments and milestones as a single parent. I’ll be frank, single parenting is lonely. You don’t have a built-in helper, you don’t tag-team it, you don’t get many breaks, and not many other mamas really "get it." One thing I’ve learned in my first year as a single parent is that it’s super important to make memories with your kids and document them somehow. Today I’m going to share a few reasons why it’s so important to have a record of these seasons, and then a few practical ways you can start doing it right now. At the end of this post, you’ll get more info on my new book all about my journey as a single mother. So let’s dive in! Why you should document moments with your children as a single parent. So you don’t go crazy. Not all mama moments are pleasant, as you well know. Being able to laugh about the bad ones can be good for the soul and for the attitude. I have to make a conscious decision every day to not get frustrated with my daughter. Going it alone means you rarely get breaks. It can be incredibly draining and not very motivating to pull all the weight like that. It can easily lead to some bad attitudes and tempers when you’re little one is driving you crazy. Take a step back, breathe, text or call a friend, or even post a pic of your rough day (not everything has to be peonies & donuts!). I’m not at all saying to seek out pity, but DO find some encouragement in a community of other mothers and share your struggles with them. Chances are, they’re tired of being a mom right now too. Commiserate together so you don’t go crazy. So you see your strength. When I think about the most trying times with Poppy, I think about sleepless nights in the newborn stage. I think about teething. I think about taking her to family functions when she was so not in the mood, and we’d both leave in tears. Even though these memories aren’t the greatest, I try to document them somehow so I can look back the next time we’re having a rough day. When you look back at these moments even just a few months from now, you’ll see how far you’ve come and what you’ve been able to push through. You’ll see your strength, your perseverance, and you’ll feel like you can do anything. Same goes for the happy moments – they remind you that after this season of teething or tantrums, there WILL be a funny moment or sweet gesture that will snap you back to remind why this whole mom thing is totally worth it. How you can document moments of your children. One way I’ve been documenting my daughter’s first year is through weekly photos. This is really popular on Pinterest, and there are tons of different ways you can do it. For me, I wanted to remember the week number and one or two memories or milestones from that week. I also ended up using it as a way to document my favorite outfits that she wore. I never repeated an outfit, and tried to show ones she wore a lot or were my personal favorites. Occasionally I would give her a prop too, but I always kept the background and layout the same so you could really see her grow. After I add Week 52 to the mix (which will be this week! ), I’m going to make them into a book using Artifact Uprising. Another great way (and probably more common way!) to document your life with kids is through a baby book or a kids journal. Lucky for you, I have both in my shop and they’re some of my top sellers :) The Baby Keepsake Journal is mostly monthly pages to record memories and milestones of your little one at each stage from birth to 5 years old. It also includes some pages for your memories as a parent including 2 pages all about your child’s birth, a page for your parent rants when you just need to vent, lessons learned in the first weeks of parenthood and again at the one year mark, an unconventional approach to a family tree, and a page for writing your child a letter about their future. As a single mom, I know how discouraging it can be to search for baby books that don’t have “dad” plastered on every page. Having to leave those pages and prompts blank just digs the knife in deeper. 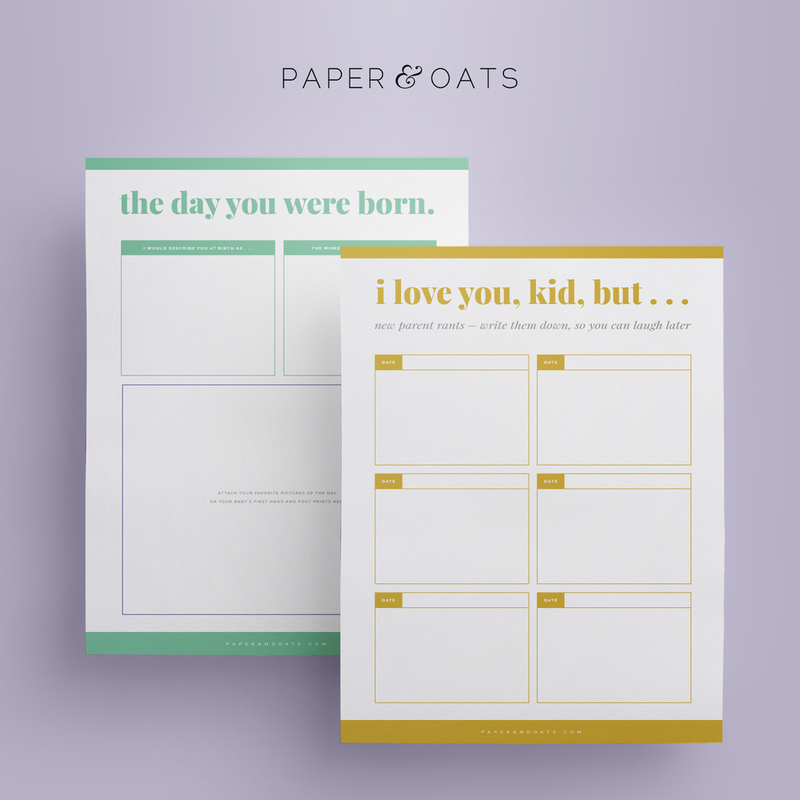 I designed my Baby Keepsake Journal to be flexible enough to work for single parents, LGBT parents, or foster / adopting parents. My Kids Keepsake Journal picks up where the baby version left off. It starts in kindergarten and goes through 12th grade and is designed for your kids to fill out each page themselves — half the fun is seeing their handwriting change from year to year! I had a journal just like this growing up, and it’s one of my most treasured keepsakes now as an adult. I love looking back to see how my interests and hobbies changed and what moments were defining my childhood. In both of these kits, I tried to make each page simple and to the point so you don’t feel overwhelmed or unable to complete them. They’re simple, stylish, and the record of your moments as a parent become invaluable once your pen hits the paper. How do you document moments and milestones with your kids? Do you have a favorite keepsake you turn to to record the good, the bad, and the ugly?